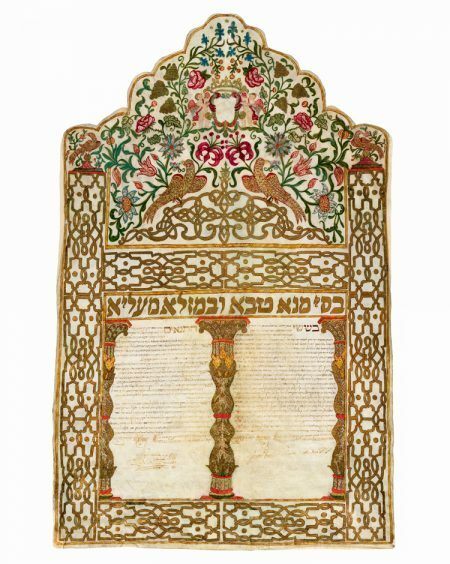 This colorful ketubbah reflects the importance given to marriage contracts by the wealthy and proud Livornese Sephardim. The families of the bride and groom, as well as the witnesses, are all noted members of the Sephardic community. The bride- groom, for example, is apparently related to the renowned contemporary Venetian rabbi Mas’u−d Raccah (1690–1768), author of Ma’aseh Roke’ah (Venice 1742), who lived in Livorno for five years (1731–36) before immigrating to Jerusalem. From there he was sent as an emissary to Tripoli where he served as the spiritual leader of the community. The upper part of the large rectangular parchment, taken from the animal’s neck, was given a scalloped edge. Surrounding the text is a wide frame dominat- ed by a vibrant interlaced pattern painted in gold. The central gilt decoration at the top is surrounded by brightly colored birds and flowers. The interlace design symbolizes a “love knot,” an idea borrowed from Italian folk culture that was often reinforced by biblical quotes (Song of Songs 1:13; Proverbs 31:30). The pair of birds perched above, a symbol of a loving couple, enhances this idea. A pair of putti at the top support a crowned shield intended for the wedded families’ insignia, which were never added. Three ornamental columns divide the two parts of the text. The conditions, written on the left, reflect the high position of the Sephardic bride in terms of her personal status and inheritance privileges. An interesting custom revealed in the text concerns the wedding day. By taking place on the eve of Passover, the families and their out-of-town guests were able to celebrate the seven days of the holiday together, while enjoying the wedding festivities.